Writing Assessment Test (WAT) forms an integral part of the entrance exam in almost all the institutes following under the category of top B-schools. Though the exam is a critical part that helps in deciding your percentage and candidature, yet the actual results and their effect may vary from college to college. The foundation or the basis of the exam and selection procedure remains almost constant with the focus on the structure followed throughout the essay in addition to the clarity and the general rules. WAT essay is similar to the regular essay but the constraints revolving around limited time and word limit in which one needs to finish the essay is a challenge. It is expected that the candidate should be able to successfully attempt the essay within the given time of 20-30 minutes. Though the time constraint limits the ability of an individual to analyse the given situation and prepare the essay in a manner that can be helpful to gain a competitive edge, yet the format is an open choice. Another key point to ace the WAT Round is to keep in view the specified word limit. Though the word limit varies as per the guidelines of each B-school but on general note a candidate is expected to successfully present the idea in the word count of 200-400 words. It is advisable that you make use of bullet points to highlight specific steps or take the paragraph way to ensure the connectivity within the essay. The basic concept to be followed through the process is to make use of the general essay structure that would have an introduction, body and a conclusion. It is expected of the candidates to provide an exceptional introduction that is not woven around simply the boring definitions and facts but has certain metaphorical story or an anecdote, which whets the reader’s appetite. The idea here is to generate interest of the exam evaluator and create an opportunity for good marks at the start itself. With the advancement of first impression is the last, it is important that the grasp of the invigilator or the reader is maintained, which could be a possibility when the introduction forces one to read further. The body of the essay should be divided in 2 paragraphs if need be or kept within a single paragraph depending on the structure and flow of the essay that needs to be picked up from the introduction. 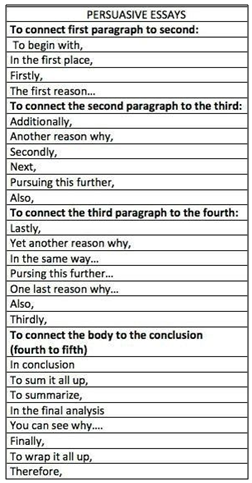 Develop an interconnection between the two paragraphs is important and it is also essential that the flow proceed with the last paragraph, which is a conclusion. The paragraphs containing the main body of the essay should have a good use of vocabulary and should have the main idea composite in it. The fact that the body comprises of the real facts or the main issue that is being discussed makes it the most important dimension of the essay. Through here to conclusion, the link should be well established and the reader should be able to get satisfied by the end. Take a look at the image provided below for writing a persuasive paragraph on a given topic. These connectors will aid you in writing a paragraph that will not only weave your thoughts in a right direction but will also give a organized shape to your otherwise scattered thoughts. The main aspect of getting WAT included in the entrance exam of top B-schools is the fact that English is an important part of the business studies. As a result, one needs to use correct grammar and also state only the facts that you aware and confident about. A correct syntactic usage and knowledge in addition to consistency is what the reader looks for. In order to achieve excellence in this domain, it is important that you practice, and do so every single day. Furthermore, acquiring as much knowledge as one possibly can is because essay topics are not restricted to any particular beat. For an MBA aspirant, it is essential to keep an eye on the conclusion as the examiner might judge you on the basis of the same. It should not be something written in haste in last 20-30 seconds, instead equal time should be given to all the parts of the essay. Through regular practice and timed efforts, one is sure to succeed in the test with an effective and interesting essay.